At Physical Therapy & Beyond, our goal is to return you to your prior level of function. Your initial visit will consist of an evaluation to determine the treatment that best suits your needs. After your initial visit, you’ll receive the most comprehensive head-to-toe rehabilitation and fitness programs to get you back to enjoying life. Our comprehensive programs are designed to treat orthopedic, sports-related, women’s and men’s health, geriatric, and pre and post pregnancy conditions. The main priority is to ensure your comfort, well-being and recovery, having helped thousands resume normal, active lives. Our therapists are McKenzie Certified Spine Specialists, trained to effectively treat all musculoskeletal problems, including neck and back pain, pain in the extremities including shoulder, knee, and ankle, as well as issues associated with sciatica, sacroiliac joint pain, arthritis, degenerative disc disease, muscle spasms, and intermittent numbness in hands or feet. This scientifically proven, exercise-based approach of assessment, diagnosis, and treatment enables patients to rely on their own body’s potential to recover from pain and disability, restore function, and learn critical skills for managing future problems. Physical Therapy & Beyond launched Beyond Scoliosis as a specialized practice to treat our countless scoliosis patients, including teens and adults, who suffer from varying degrees of this condition. Our therapists are certified in the effective and result-driven Schroth Scoliosis Method. Our skilled team has helped hundreds of patients with abnormal spine curvatures through a customized, Schroth Scoliosis exercise program that includes stretching, strengthening, and breathing techniques that focus on halting curve progression. 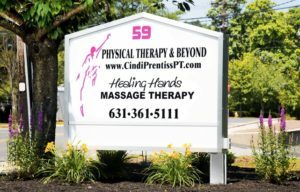 Cindi A. Prentiss, developed a multi-faceted program for women experiencing back pain during and after pregnancy. Drawing on her own experiences with pain during pregnancy, she incorporates core stability, body mechanics, sleeping position and pressure-relieving postures, flexibility and strength training in a proven program. Education DVDs are available for at home use as well. Women of all ages often suffer from many complex and misdiagnosed health issues. Our physical therapists are trained through continuing education courses and lab training to professionally and compassionately treat pelvic floor dysfunction and pain, incontinence, vulvodynia, coccyx pain, surgical scars, and osteoporosis. As a woman-owned practice, we strive to provide all patients a life without limitation. Our therapists use rehabilitative exercises, bio-feedback training and manual therapy to successfully treat male patients who suffer from coccyx pain, surgical scars, incontinence and pelvic pain, including men who develop urinary incontinence following prostate surgery. Myofascial Release is a one-on-one, hands-on technique that provides sustained pressure into myofascial restrictions to eliminate acute and chronic pain and restore motion to all parts of the body. Our therapists are highly trained in this innovative and effective technique that is used to treat orthopedic, back, neck and hip pain, headaches, migraines, TMJ Disorder, migraine headaches, Chronic Fatigue Syndrome, painful scars, sports-related injuries, and a broad scope of Men’s Health and Women’s Health issues, including Mastectomy Pain, Menstrual Problems and Endometriosis. Whether you are an athlete or someone who enjoys moderate exercise, our qualified therapists specialize in treating sprains, strains, tendonitis, joint replacements, joint instability, fractures, dislocations, ruptured tendons and pre/post-surgery treatments. We offer accommodating payment plans. AMERICHOICE, ANTHEM, BEECH STREET BLUE CROSS/ BLUE SHIELD, CIGNA/Orthonet, CHN Consolidated Health Network, FIRST HEALTH, HIP/EMBLEM HEALTH, GREAT WEST, HORIZON, HUMANA, ISLAND GROUP, MAGNACARE/ MAGNA COMP, MEDICARE, LIRR MEDICARE, METROCOMP, MULTIPLAN, MPN, NO FAULT, OXFORD, PHS/HEALTHNET, (HEALTH NET-ORTHONET), ISLAND GROUP, SELECT PRO, TRICARE, UNITED HEALTHCARE, VYTRA, WORKERS COMPENSATION, and DEPT. OF LABOR.